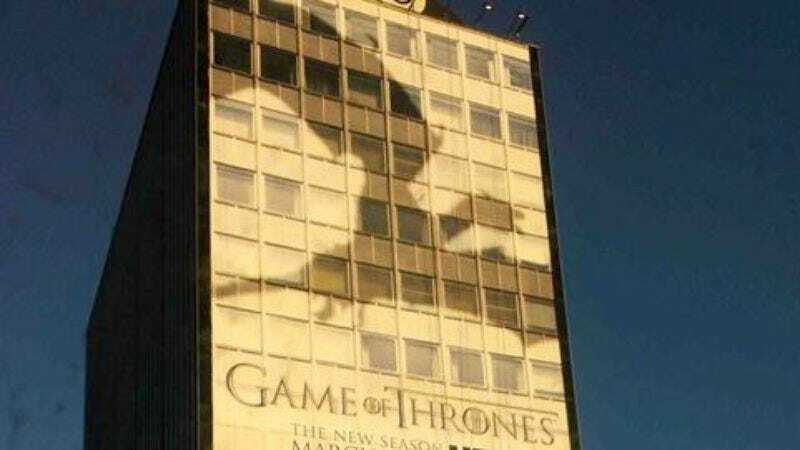 Just as the trailer for season three hit the Internet, Game Of Thrones took its publicity campaign to old media on Monday via some creative advertising in print and billboard. In Monday’s New York Times, there was a two-page spread in the Arts section featuring a dragon shadow over fake news stories. More effective is the shadow on HBO’s L.A. headquarters, which Adweek caught on Wednesday. As the trailer shows, this is the season we finally see dragons in action, not squawking in a cage or something. Considering Game Of Thrones’ reputation for T&A, maybe something along the lines of trucker mud flaps would also have been appropriate?